I’m not sure why I have such a thick skull….I wish I would have learned some of these lessons a couple decades ago. I recently was a guest blogger for Gibson Insurance and I thought this may be of value to some of you. Here’s to you achieving more by focusing on LESS in 2018. I have a nasty habit of taking on more than I can handle. It’s been a very difficult lesson to learn and I have no idea how much it really has impacted me because I can’t ever get that time back. My first "AHA" moment was when I was 23 years old and opened an Edward Jones office from scratch (no clients, no assets under management) in Caro, Michigan. I said YES to just about everything that breathed as I began building relationships in a new community. At one point, I was doing all of these things at the same time…. While all the things listed above are not bad, in fact, many were actually very good, I was spinning out of control and so overwhelmed that I was very little value to anyone. LESS IS MORE. I needed to cut out most of the stuff on that list so that I had the energy to be GREAT at a few things. I made the same mistake when I started Leader Legacy Inc in 2012. Because of my desire to have impact in my community, I took on the role of hosting the Leadercast event within the first year of starting my business. I set big goals and within two years I was hosting one of the top 5 largest Leadercast sites in the world….and I loved it. I took it a step further, when I believed we could bring in some of the top national speakers LIVE to our community. To date, thanks to our sponsors we brought in John Maxwell, Darren Hardy, Les Brown, Bob Chapman, Chris McChesney, Bonnie St. John, Eric Thomas, and many others. We even turned the local live event into our own simulcast event where we had 35 sites viewing this event across the country. This was a GREAT thing and the impact was tremendous. In fact, last May, we filled the Century Center in South Bend with 1,460 people that attended Lead USA and another 1,500 people across the country via simulcast. So, you may ask…what’s wrong with that? I have a passion to speak. I have a passion to train and coach teams. I only have so much time on this planet and I want to have the most impact possible. Speaking and training teams and individuals is VERY DIFFERENT from event planning. While I may be good at both, there’s only ONE that I truly want to be great at. I did the math. That one event cost me 4 months of full time work and 6 months of part time work every year. I wore myself ragged trying to do it all. Listen to me carefully. I can’t get my time back and I don’t have any regrets, I learned a ton. But, I didn’t increase my experiential knowledge as a trainer and coach over the past 5 years like I could have, because I was so busy selling tickets and sponsorships. LESS IS MORE. These were two great things, but I only have the capacity to be great at one. You’ll never be truly great at anything if you allow yourself to do a lot of good things. 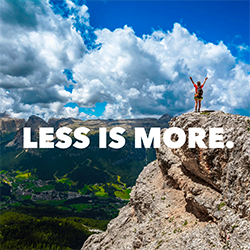 You can do more with less. It’s been 7 months since we hosted Lead USA and 5 months since we decided to cancel Lead USA for 2018. My speaking, training, and coaching business has doubled. I’ve spent more time reading, training and honing my speaking/training skill in the past 6 months than I have in the past 5 years. I’m having deeper impact with a smaller number of teams, plus I’ll actually impact more people across the country speaking at their events than creating my own. Truly, LESS HAS BEEN MORE, every time that I’ve cut something out and I believe it can have the same effect for you. Make two lists: First, a list of all the BIG things you are committed to and second, all of the little things you are committed to. Is there anything that I can and should completely CUT out of my life? Is the stuff on this list truly important that I do or can I simply stop doing it? Is there technology available that could help me streamline this activity to reduce the amount of time it takes me to complete? Is there a better way to do this low value work to not intrude on the important stuff? 1. EOS: What it is and how it can be helpful to you. If you know of anyone that needs VISION, TRACTION and HEALTHY….please point them in my direction. As of Sept. 1st, 2017, I hired a part-time team member and she’s a rock star. Sheila Dodd and I have worked together through LifeWorks Ministry, a mission that my dad founded more than 10 years ago. LifeWorks is a college and millennial age organization that’s primary focus is to IGNITE FAITH, BUILD LEADERS and LAUNCH WORLD CHANGERS for Christ in that age demographic. She’s full time at LifeWorks having tremendous impact as a mentor to these amazing young men and women as well as the Integrator (Ministry Administrator). I’m very grateful to have her part-time support in my business as an Executive Assistant.